It occurred to me that it was a while since I’d made hummus, and as I had a brand new jar of tahini, I thought today might be the day to put that right. 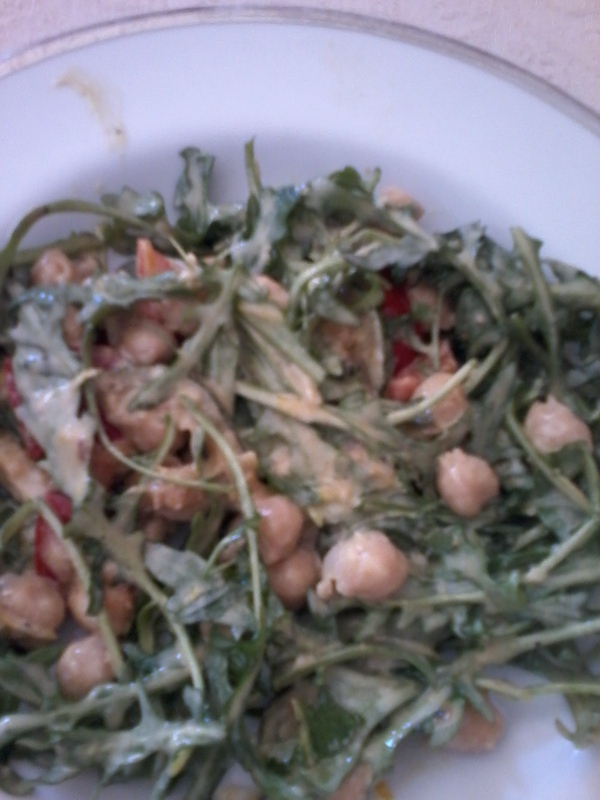 Then, I noticed that there were a few odds and ends in the fridge this morning and I decided to combine them in a salad and use the tahini in a dressing. Open the can of chickpeas and toss them into a sieve. Rinse them under running water and leave to drain. Peel and finely grate the garlic. Cut the courgette into small, thin, bite-sized pieces. Cut and core the red pepper. Make the dressing by combining the tahini, garlic, honey, zest, orange and lemon juices. Mix gently and add a drop of water until it’s slightly runny. Whisk gently with a fork until you have a runny consistency. Gently heat a glug of olive oil in a frying pan and add the courgette pieces. Fry them over a medium heat until they start to brown (about 10 minutes). Add the pepper pieces and fry them for a further five minutes. Get out a large bowl and throw in your chickpeas, rocket and the fried vegetables. Pour the dressing over the combined vegetables and toss the lot together. Scatter a few mint leaves over the top and tuck in! Posted on April 6, 2015 by Hazel Katherine Larkin	• This entry was posted in Uncategorized and tagged Chickpeas, Lunch, Salad, Tahini. Bookmark the permalink.